Did You Know About These 14 Really Awesome Tricks You Can Try On Google Search? Just type ‘Google in 1998’ in the search bar and see it for yourself! This is how Google actually looked like, back in the year 1998! Are you bored with the same old boring Google home page? Just type “Do a Barrel Roll” and see how it works. The screen will rotate 360 degrees! Typing ‘Askew’ in the search bar will make your Google look slightly different. This trick will tilt your screen a few degrees! Type ‘Atari Breakout’ in the Google search bar and go to Images. This will return the image results for the game for a moment, before turning into the game itself! Drawing from the popular game StarCraft, tying ‘Zerg Rush’ turns your Google search page into a battleground between your search results and tiny ‘O’ shaped zergs which take over the entire page. Try this out immediately! Anagrams are word rearrangements. Google fools around with us if you type ‘Anagram’. Just see the “Did You Mean” result and you will LOL for sure! Then search ‘Define Anagram’ prompts the response asking "Did you mean: nerd fame again." Well played, Google! Type Festivus on search bar and Google adds a Festivus pole bar to tell you what it means. Festivus is celebrated each year on December 23rd. Popularised by the sitcom Seinfeld, the usual Christmas tradition of a tree is turned into an unadorned aluminium pole, which parodies normal holiday materialism. Are you a person who makes decisions with the flipping of a coin? Then let Google do the work for you! Just type ‘flip a coin’ in the search bar and see the result. Type ‘Roll a die’ and Google will roll a die for you. That simple. Webdriver Torso is YouTube’s test channel which uploads videos consisting of varying patterns of blue and red rectangles. The Google logo changes similarly on typing these words in the search bar. If you want to play Pacman instantly then Google has a solution for you. 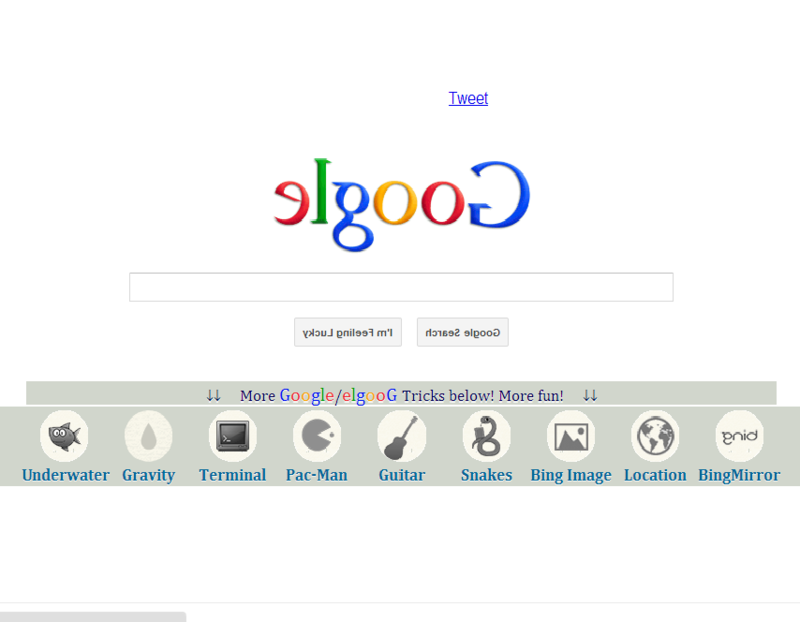 Just type 'Google Pacman' and you can play Pacman then and there itself! Just type “I am feeling curious” and Google will provide hundreds of new facts to keep you entertained for hours. This is something interesting again, just type “Conway’s Game of Life” and see it yourself. Conway’s game of life brings animation of blocks on the right hand side of the screen; this life simulation was created by British mathematician John Conway in 1970. Technically, it's considered a "game" and is in fact, a zero-player game. Know more fun tricks with Google? Let us know in the Comments below!